Marine sludge pump is sometimes also called marine slurry pump, marine mud pump or marine residue pump. SILI PUMP is familiar with these marine sludge pump application in marine and offshore industry. And we provide a few optional models for our clients. Marine sludge pump, as it is otherwise known, is designed for transferring waste fluids with high solid content. Typically the marine sludge pump design is a positive displacement pump. It enables the handling of heavy, viscous and abrasive liquids including waste, sewage and mud. Marine sludge pump is often progressive cavity or AODD Pumps. (Marine air operated double diaphragm pump). Sometimes, a gear oil pump can be also used to handle marine oil sludge, like the marine waste oil and so on. These marine waste oil pumps can be in external gear pump, internal gear pump and circular-arc gear oil pump. And these waste oil gear pump can be in thermal insulation jacket covered. A typical application on board ships or vessels for marine sludge oil pump is for the residue from purifiers after the lube and fuel oil have been purified. The sludge oil or dirty oil is stored in a tank. From the tank, it is being removed when the tank is full. Usually, the marine sludge pump has a low amount of running hours. The single screw pump is also named as single helical rotor pump, or progressive cavity pump, or eccentric screw pump. It is the most popular marine sludge pump in marine purpose. It is positive displacement type pump. So it can handle the sludge or waste oil in good condition. Pay attention about the difference between bilge water and sludge. 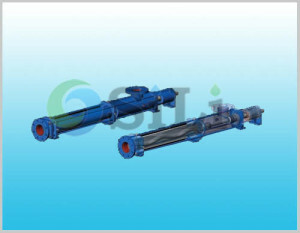 SILI PUMP is a reputation marine sludge pump supplier and manufacturer in China. Click the following link to find a suitable pump model: marine sludge pump. Any inquiry or comments about the marine slurry pump, just contact us.